As Japan's first specialized manufacturer of stainless-steel cold-rolled strips, NAS Stainless Steel Strip MFG. Co., Ltd. has a long history. Committed to creating original high-value-added technologies, the company makes and sells a wide range of high-precision, high-quality products. Our products offer remarkable shape accuracy and luster and are used not only for conventional applications, but also to produce parts and components for specialized equipment in advanced industrial fields. As a result, our products have won high praise across many different industries. We develop original technologies and have ventured into the fields of super-thin sheet materials and electronic materials. Leveraging our technical expertise and specialized know-how, we continue to develop products that meet the changing needs of the times. 2015/ 1/27 ISO14001 Certification received at all business places by certification expansion. 2013/12 We changed the representative office to the local corporation in Bongkok. 2012/11/ 1 We added information on new high value added Stainress steel NAS 304-K3. 2012/ 8/ 1 We placed photographs of bookmarks courtesy of Yoshizumi-Press Inc. modeling Tokyo Sky Tree Tower made from our stainless steel. 2012/ 8/ 1 We added information on our new high value added NAS 304-K3. 2012/ 4/12 We renewed the link to our group company. 2012/ 4/ 5 We opened English language version of our home page. 2012/ 4/ 2 We opened a representative office in Bangkok, Thailand. 2012/ 3/ 5 We moved our Tokyo office. 2011/ 7/22 We renewed our home page to link to Miyazu Kairiku Unnyu Co., Ltd. home page. 2011/ 6/ 1 We renewed our home page. 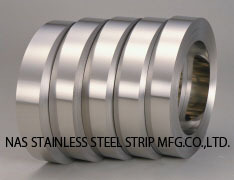 Copyright (C) NAS STAINLESS STEEL STRIP MFG.CO.,LTD. All Rights Reserved.